Though it came as a bit of a surprise, quietly tucked away into Nintendo's Digital Event during E3 earlier this year, fans of RPG silliness have been anticipating the crossover of a lifetime since the announcement of AlphaDream's latest adventure. 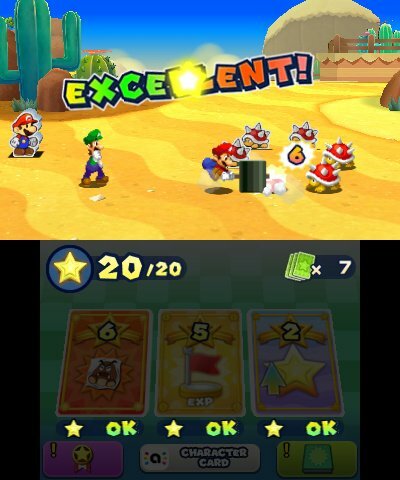 Mario & Luigi: Paper Jam Bros. (known simply as Mario & Luigi: Paper Jam in North America) - combines the unique 2D aesthetic of the Paper Mario series with the co-operative team gameplay of Mario & Luigi to great effect, with almost all the right parts neatly folding into place. 'Neatly' is perhaps the wrong word in this instance however, as it isn't exactly an even mix. Merging these two universes always seemed like a natural choice given their core similarities, but Paper Jam's recipe is definitely four or five parts Mario & Luigi for every one part Paper Mario. That's not at all to say that this is an inherently negative imbalance; we simply feel it's a worthwhile distinction to make for anyone eagerly awaiting another fully-fledged Paper Mario title. It's close, but the real fun comes from seeing this superstar trio team up together for the first time. That being said, how on earth does this all come about in the first place? Well you can blame Luigi. It's his bumbling about in a dark storage room somewhere in Peach's Castle that accidentally sends a mysterious book tumbling to the floor, unleashing the Paper Mario universe in a confetti typhoon. Suddenly, the Mushroom Kingdom is filled with wafer-thin duplicates of Koopas, Toads, Shy Guys, oh my! - and our story begins as both versions of Princess Peach try to make sense of it all. For fans of either series, these initial character interactions are an absolute treat, and make up for a pretty run of the mill plotline when all is said and done. Watching Bowser and his equally oafish paper counterpart argue over the princesses, debate who's in charge and murmur identical plans for betrayal to their own personal Kamek is hugely entertaining, but the story never really moves beyond their simple plan to take over the Mushroom Kingdom. Reaching his castle is pretty much the singular goal throughout your journey, which feels focused (if a tad too familiar) as a result. With double Bowsers, a pair of Bowser Jrs and a whole host of Koopalings to deal with, it's a good thing that Paper Mario makes for such a powerful ally. His addition feels natural within moments, leaving us wondering how we ever managed without him in the first place. From combat to exploration, controlling the Bros. now requires three separate buttons, with Mario, Luigi, and Paper Mario mapped to A,B and Y respectively. With that added button comes a long list of extra abilities, not least of which being a team jump that's triggered by tapping X. Holding it allows for a lengthy burst of speed, often required when hunting down paper Toads (more on this later) or traversing large areas. Further trio actions are steadily unlocked as you progress, and primarily help clear a path past all manner of obstacles. A triple hammer breaks huge blocks for example, and Paper Mario can even transform into paper airplanes to cross gaps, or slip between tiny cracks in the walls. In combat, working as a trio is similarly effective, and the hugely interactive battle system is still as fun as ever. 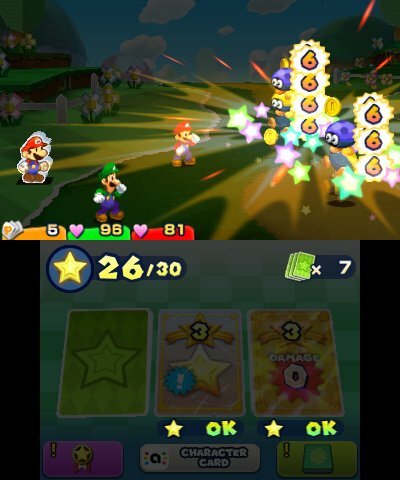 As well as the typical 'Jump' and 'Hammer' commands, Paper Mario can now create multiple copies of himself to boost both his attack and defense - a tactic that paper enemies also regularly take advantage of. He specializes in taking free hits and attacking multiple baddies at once, which creates some great synergy with the Bros. on the front line. Stats can be customized by using specific beans or choosing from a list of one-time perks that set each character apart, so our Luigi ended up as a hammer-swinging defensive powerhouse, while Mario opted for speedier jump attacks and critical hits. It's admittedly fairly shallow as far as RPG customization goes, but that's not the only way you can influence battles. The introduction of Battle Cards feels something like an alternate version of Paper Mario:The Thousand Year Door's star meter, where performing well in battle added to a pool of star points to be spent on special abilities. Similarly, in Paper Jam you eventually unlock a deck of cards that can heal you, deal extra damage, or affect your stats in many different ways, all at the cost of star points. The bottom screen displays up to three at a time, which can be activated or skipped over during any of your turns, and get randomly dealt out from a fully customizable deck. 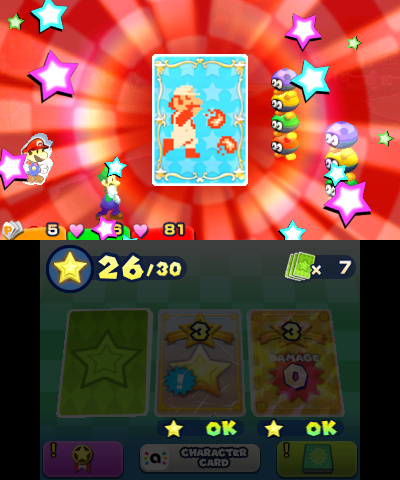 Dozens of unique, more powerful cards can be purchased in shops, earned as prizes, or are unlocked by using a Super Mario themed amiibo. The killer downside to using an amiibo is that you'll need to continuously have it on hand just on the off chance you'd like to use the card, and the setup process is a laborious string of saving and erasing data to say the very least. The battle cards themselves add a fresh new dynamic and work great, but the amiibo functionality is all too easily ignored. Bros attacks and the new, even more powerful Trio attacks are still a joy to execute and behold, as Paper Mario helps pull off some impressive stunts such as shuriken tossing and extreme kite flying. Boss battles, always a highlight of the series, are the perfect culmination of skill and spectacle, with elaborate ways to dodge moves using Paper Mario as a glider or boomerang. No two boss encounters are quite the same, and while we certainly don't want to spoil any surprises, there were more than a few moments that really caught us off guard and forced a quick change of tactics. All this battling is only part of the adventure though, and an entirely new quest system adds a lot of variety to proceedings. Lakitu Info Centers serve as quest hubs, where an ever-changing selection of Paper Toad rescue missions offer up brief slices of instant gameplay in the form of puzzles, quizzes, or hide and seek chases. Most only take a couple of minutes to complete, but are a refreshing change of pace that never outgrew their welcome in the slightest. Rescuing these poor Toads isn't just a fun diversion either, but is actually necessary to progress in the story. Why? Because the more you rescue, the more slaves - sorry - "assistants" Toadette has on hand to help build gigantic papercraft weapons of course. Like the giant Luigi fights featured in Dream Team, these large-scale brawls are a gleefully gimmicky way to mix things up with some tank-like confrontations. Large arenas pit your creation against a slew of enemies, encouraging sumo slams and quick dodging to win the day. Powering up prompts a quick rhythm game, while different papercraft characters have their own individual abilities to play around with too. It's nothing too groundbreaking, but comes along seldom enough to always provide an enjoyable beatdown. All of these new ideas come with plenty of tutorials to ease you in, as well as a few gameplay options to make things a bit simpler. You can practice attacks, toggle certain indicators and even activate an easy mode to beef up your bros at the expense of skill points. Guarding at the last minute also helps raise your defense if you can't figure out how to completely avoid an enemy. The best part of this is that almost every tutorial can be completely passed over or skipped through if you aren't interested. The 'R' button fast-forwards through text boxes and cutscenes at lightning pace, so there's always a way to keep things moving if you so choose. These options, combined with a more stripped-back story and brand new mechanics, arguably make this the most accessible entry in the series to date. Newcomers won't need to worry about past events or catch up with the old pros; everything can be toggled to suit your playstyle and skill level, with a classic Mario vs Bowser story to follow at your own pace. If the Mario & Luigi games never appealed to you before, this is a very good place to start. In fact, it could even be recommended to anyone looking to dip their toes into an RPG for the first time. Graphically, Paper Jam does a superb job of blending both art styles into something striking and colourful. Each and every character is portrayed beautifully, with clear lines standing out against the softer curves of a three-dimensional world, and the localization team have worked wonders on the dialogue as per usual. The nature of this crossover allows for some really interesting character moments, since key players get a mirror held up to themselves. For example; we have Princess Peach's secret desire to chop her hair off, or Bowser Jr's implied loneliness. It's great stuff, but after a while some of that novelty eventually wears off, and the creases unfortunately begin to show. The rolling green hills, sandy deserts, spooky forest and icy mountain that make up the majority of the game feel slightly tired before you even arrive, and while some paper-themed architecture helps alleviate this, we felt a bit of Skyward Sword-esque déjà vu at times. There are some interesting areas like the underground prison, but travelling from basic Toad village to basic Toad village got pretty stale. We couldn't help but imagine what fun it would be to see even more characters like Kammy Koopa arrive with paper Bowser, or to jump backwards and forwards between both dimensions multiple times. For a beefy 30+ hour playtime, there's a lot of variety when it comes to gameplay, and Paper Jam stands tall with its contemporaries both flat and portly. It just doesn't quite rise above them when it comes to the story, so if the idea of this crossover hasn't already piqued your interest at least a little, then you may end up tuning it out completely. Not quite the multi-universe revolution it could have been, but AlphaDream certainly didn't resort to playing things too safe. 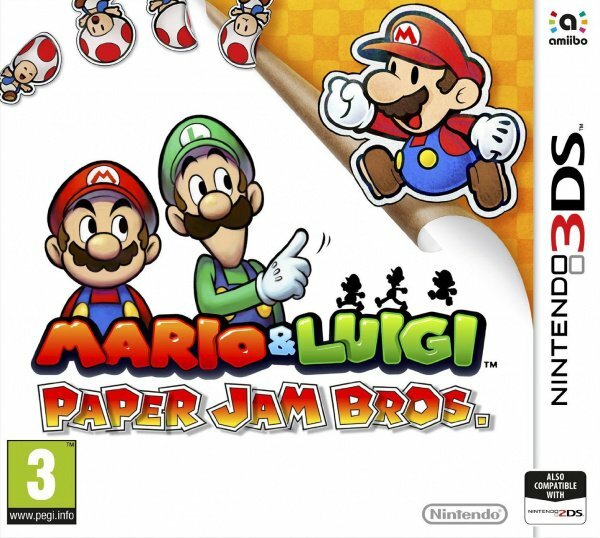 Mario & Luigi: Paper Jam Bros. totally succeeds as an accessible, entertaining and lengthy crossover for fans and newcomers alike. It introduces a solid list of worthy new mechanics, particularly building upon the battle system in some exciting new ways, and breaking exploration up with random quests. It's more of a mini RPG than ever, but doesn't quite nail it when it comes to environmental design and storytelling. In the end it's Paper Jam's simplicity that makes it a great starting point and an easy recommendation, but also holds it back from taking full advantage of more dimensions than ever before. Sold! Picking it up then. This'll make a fantastic birthday gift. Brace yourselves folks, the angry mob is a'comin' for Nintendo daring to release a Mario & Luigi game with Paper Mario but without Fawful, Count Bleck, the Shroobs, Cackletta et all. RUN FOR THE HILLS!!!!!!!!!!!!!!!! This came out? I haven't been keeping up with it well I guess. Or is it just not in NA yet? I really excited about this title but on the other hand I'm getting tired of some aspects in the Mario & Luigi formula. I guess there'll be the same tutorials I've seen before, similar places to visit according to the review and I guess Peach gets kidnapped and Bowser is the final boss again. 1st and 3rd games in the M&L series are my favourites, I hope this one would be as good as those two. So the review was pretty lengthy and I didn't read the entire thing... Is this game as hand holdy and slow as dream team? I'm still waiting for a real Paper Mario JRPG Style to come back to the consoles. Nice review and nice score. A pity about the story, but everything else sounds good. Sold! This sounds like its a LOT better than Sticker Star! Got this coming, looking forward to it. I never played the DS ones, so will have to go back to Inside Story at some point. I just don't feel confortable seeing two (adult) Mario's on screen, If it was Paper Mario + 3D Luigi I think it would look better. Of if they could transform back and forth. @uhhhhhhhh "The best part of this is that almost every tutorial can be completely passed over or skipped through if you aren't interested. The 'R' button fast-forwards through text boxes and cutscenes at lightning pace, so there's always a way to keep things moving if you so choose." 8/10 is good enough to purchase and play even without reading a review, but where are those 10/10 3ds and Wii U games scores. Are Nintendo games struggling to reach past heights. Always liked Paper Mario but got a bit tired of the Mario and Luigi series, maybe others have as well. Still waiting for that Wii U Super Mario RPG game that was suppose to be release. If Nintendo missed this one then the Wii U would be the first ever Nintendo console to not have a Mario RPG at all since the game series first started on Super NES. Still waiting on that XCX review. It's a lower Nintendo Life score than any of the past Mario & Luigi games, but it still scored higher than I expected. Really looking forward to it now, especially after that Koopalings trailer. @zool wait a few hours bruh. Oh thank goodness. I was really looking forward to getting this and was worried it would be mediocre like the rest of the E3 games. I'm so glad this isn't coming out this year here. Got enough to play as it is and I still want Yokai and Xenoblade is this week. Only so much time to play all these game coming and already got. @TeeJay Exactly the same here. I was starting to worry Nintendo was losing their touch lately, glad to see that's not the case (entirely, yet). Been reading a few reviews this morning and it sounds like it's a solid improvement over Dream Team Bros, but perhaps not quite matching the heights of Superstar Saga and Inside Story. I wasn't planning on getting at full price but might actually do that now. I was kind of hoping it scored a 9 really but I'm still going to buy it, looks really fun. I do feel some times Nintendo dumb down things for the real gamers in the name of accessability. There are plenty of Mario RPGs on Super Marion Maker. I played I really fun one, it had three separate campaigns, just yesterday. Dream Team Bros was completely awesome, so I have all the faith in this game. I am in no immediate rush though, so I'll likely pick this one up sometime next year if I find it cheap enough. Good news. I was very wary of this after the disappointments of Dream Team and Sticker Star but its reviewing well all over so I'll have to give it a crack. Sounds promising. This is looking great so I have it on my Christmas list, wish they used Paper Mario 64 for the basis of the Paper side instead of Sticker Star though. I love this series, including Dream Team! This one is a must buy for me! I dare to say I love this spinoff rpg series more than the platformers. I was worried about the reception for this game since on the outside it looked like Dream Team cross Sticker Star. Glad it's more than that. I wasn't impressed with the original trailer for it. However, if people are saying that it's great, then I'll have another look at the game. This series is already an auto-buy with me, bring it on! As long as this game doesn't have really unnecessary padding like Dream Team did, I'll be willing to get this eventually. I can stand a little bit of padding with sidequests and such, but when I'm told to go north to climb up a mountain, I expect to climb the mountain when I get to it, rather than being told to go all the way south just to find a pair of brothers, only to find that one of them is missing, and then having to enter the dream world when I do find him, so that I can look for four obnoxious bosses just to wake him up so I can climb the stupid mountain. Seriously, just thinking about that part makes my blood boil! I had meh feelings about it at first, but now it's a buy for me. Hopefully we'll get a traditional Paper Mario game afterwards, but I guess this will have to do for now...despite my eyes and heart calling Paper Jam a Mario & Luigi game. 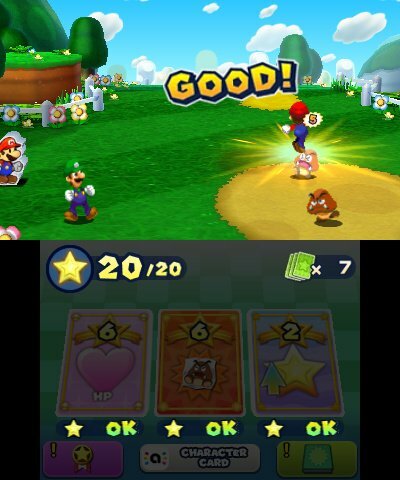 Mario & Luigi has been a hit-or-miss series, in my opinion, with Superstar Saga and Dream Team being the only games I have enjoyed while the DS entries disappointed me to great lengths. Hopefully this game is as good as this review says. Looks fun and probably will pick it up at some point but as a bigger fan of the Paper Mario series than the M&L series, man this is such a tease. What level? Would you mind sharing the code? Dream Team... went back and forth between "actually kinda fun" and "testing my patience". Mostly because battles seemed to last an extra turn or two longer then they should've, coming across like prolonged frustrating minigames. It'd probably be my 2nd favorite Mario & Luigi... but a distant 2nd, to Superstar Saga. Ah well. I've almost beaten it. Then I can move on with my backlog, and be ready for Paper Jam next year. Hopefully battles don't get bogged down by excessive defend / counter actions.... again. Mario & Luigi never disappoints me. This was my favorite announcement of E3 this year. This will make a great birthday present for me. Can't wait for Round 5 of M&L goodness! My only question is: is it better than Sticker Star and Dream Team? Because both of those were kind of repetitive and had lots of unnecessary fetch quests and the like. 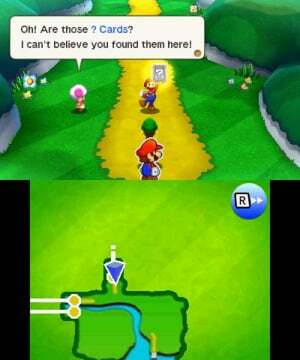 It bogged the game down in ways the older Mario and Luigi games and Paper Mario games didn't. 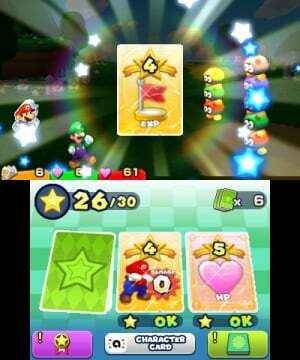 The "Luiginary" and sticker mechanics were pretty clunky and took away from the core aspects of the game, as well. @allav866 You just summed up everything I hated about Dream Team in one paragraph. This and other silliness in that game is why it's still unfinished in my queue. It's pretty hard to mess up a Mario & Luigi game as all of them are fun despite having some occasional flaws here and there. @martimusprime The worst part is that I really enjoyed most of the game, but that part made me put it down for weeks. If the game told me to go south first, and didn't mention the mountain until it was actually time to go there, I wouldn't have minded so much. The only other issue I had with it was how slow Mario and Luigi's movement felt in the 2D sections. Bowser's inside story is a master peice and is in my top 5 games of all time with Fawful being one of my favourite video game character's of all time. So dream team was probably my second favourite in the series so hopefully this game can be justbas good if not better than dream team! Shame about a lack of characters this was a perfect opportunity for some awesome crossover character action, then again seeing Fawful again would end his aweosme ark but other characters could of made the cut just my thoughts I'm still excited for this game! Europe got the long end of the stick this year! I would much rather have this game here in the US this December instead of January than have Captain Toad last December instead of this year's January. …If you can understand that run-on there. @zool not every Nintendo game did get 10/10 scores no matter how go the game actually is. Lol. Splatoon is a good example of that. Thank god, I knew this would be better than everyone was whining about. Man I'm sooooooo excited, a crossover of two of my fav series! Can't wait for Christmas!!! @Squidzilla Great review, cheers. I'm a little concerned about the story. Is it really simple, or has it got some good twists (no spoilers ) as the story and the twists are a large factor of why I love the games so much. are they any annoying mechanics? dream team had poorly done gyro controls. Xenoblade and this! RPGs forever. Just got Rune Factory 4 finally too. Been a good couple weeks. @BrizzoUK My first game in the series was BiS, trust me the Bowser combat scenes are the most fun part of the game. Stripped back story. Great. 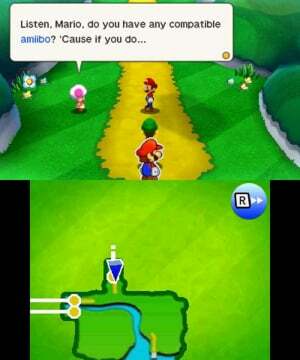 Don't worry, it's not like the story is one of my favorite elements of Mario & Luigi and Paper Mario games. I hope that the new Zelda has no story as well, and that no Nintendo game ever has a story again. Sounds like it should be fun. I love the Mario and Luigi series, so I'll definitely be interested in getting this one when it releases! This is at the top of my Christmas list, I can't wait to get it! I haven't played many of the Mario RPGS, but I've loved the ones I have played, and I'll try and get them all eventually. Sounds pretty fun! Looking forward to getting it. To me, it seems like Nintendo focused more on the dialogue between the characters and their paper counterparts than the actual gameplay. Switching between the real and paper worlds seems like an obvious choice, as does adding Paper Luigi to the trio. Nintendo thought that the RPG series' were so popular that they could just throw them together without even thinking. But hey, I'll have to get the game to figure out whether I'm right or not. Mario & Luigi games are great and I had a huge feeling this one was going to be no exception, so I'm glad I was right. Definitely picking this up when it comes out, January 22 is enough of a wait for me so I can have a chance to save up. Plus Xenoblade X is going to consume too much of my time anyway. Had absolutely no doubt this would be a great game. I can't wait to play this one. After reading the review, I am even more excited to pick this game up next year. I loved Bowser's Inside Story, however, Dream Team was a bit of a bore to me with all of the tutorials and tedious "Luiginary" segments. I'm glad to hear you can skip or speed up through tutorials in this installment, and there doesn't really seem to be any gimmicks this time around aside from the paper-craft battles. The story may not be the most interesting, but I'm sure the faster pacing will make this my favorite in the series! Still looks extremely generic. Generic worlds, enemies, NPCs, and story make me not want to support this game. 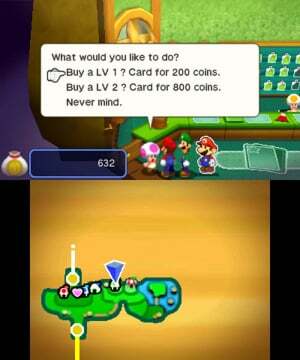 That was the main reason why I hated Sticker Star. I'm sick of these "It's like NSMB... but an RPG!" type of games. Sorry, I prefer to have originality in my games. This game looks friggin brilliant! I should probably play Mario & Luigi: Dream Team first though since I still haven't played that one. The environments look competent art-execution-wise, but indeed a little phoned in as far as imagination and design goes. Still, this looks highly enjoyable! "All of these new ideas come with plenty of tutorials to ease you in"
Yeah, that was exactly the reason I rage quit Dream Team. That game was awful, it was more tutorial than actual gameplay! Okay, maybe that's an exaggeration, but when I'm 12 hours in and it's still stopping me from playing constantly to tell me about a new mechanic they added in, it gets old. Instead of cramming in everything and constantly having to have unskippable tutorials to explain everything, focus on a few core mechanics and then let us off the leash as they get fleshed out into more complicated puzzles. Dream Team literally felt like a kiddy game, as in a game meant for kids and kids only. It even gave me a tutorial on how slowing down time lets you jump farther AFTER I had already slowed down time and jumped over a huge spike pit. Ugh. "The best part of this is that almost every tutorial can be completely passed over or skipped through if you aren't interested. The 'R' button fast-forwards through text boxes and cutscenes at lightning pace, so there's always a way to keep things moving if you so choose." I don't like the sound of "almost" though. Can we get more detail on that? I would love more information on what "almost" means if there's any way the author can go into more detail. With a name like Paper Jam it really should have come bundled with the successor of the Game Boy Printer. Or at least contain some office humor. @TeeJay Really? They showed like ovef 10 new games, and the only ones I remember scoring less than a 7 were Mario Tennis U, amiibo Festival and Zelda Triforce Heroes (which got a 6, so it is not mediocre). And every M&L was pretty enjoyable, while other games at E3 have not been released, so you have no right to praise/bash them. And NEVER generalise a company's products, especially when they are releasing around the same time, because, in that case, there are different teams developing them. @Arlo Mario & Luigi was never about the story. It's other games, like Fire Emblem. And you are talking as if there is a Zelda game since the 4th gen where there was no story. Even the freaking CD-i games had a story! @wazlon There is no such thing as a 'real gamer'. But you can't really say that the games are dumbed down, because you have Donkey Kong Country Tropical Freeze, Yoshi's Woolly World (the collecting part is really hard), Super Mario 3D World (the bonus worlds), New Super Mario Bros U (challenges), Pikmin 3 (missions) and this is only some games on the Wii U.
I don't think I'm getting this one. Tonally it seems to be Sticker Star 2, and I thought Inside Story was only any fun when you were playing as Bowser. Think i might import this. Don't feel like waiting til almost end of January to get it in the US. @Parkour_LMan They don't have to be "about the story" to have a satisfying one. I disagree with Nintendo's idea that just because the story isn't the most important part, it's thus worthless and to be jettisoned (3D Mario starting with Galaxy 2, Paper Mario starting with Sticker Star, Mario and Luigi starting with this one). It's pure laziness and dumbing down, and I don't enjoy a game nearly as much when it's stripped back in this way. Other people don't seem to care though, so I guess that's cool for them. I'm probably in the minority. Insta-play for me, no question. Though some things are starting to get a little jaded between both series, the charm, humor, and wit are too entertaining for me to pass up. Awesome, can't wait to get back into the Mario and Luigi series; this looks like a great place to start. It's worth noting, your review header calls this Mario and Luigi Paper Jam, but you get the title correct everywhere else. Also, the "Series" isn't Paper Mario, but rather, Mario and Luigi RPG. @pherret022 Those are just fan made which are cool but I want a true follow-up to The Thousand-Year Door. I was just never a fan of Super Paper Mario. The story is fairly simple overall, and there aren't too many twists or complications along the way. It's a fun ride, but definitely nothing too fresh. The writing is very strong though, so the characters make it entertaining! @Squidzilla That's a little disappointing. I was hoping for another great plot, but oh well. Hasn't put me off the game at all tho. I love both series so this is like my dream. Looks funny (as you said), battle system seems great (like all the other entries and looks like great fun to play. So excited! @wazlon Luckily those parts are skippable. Accessibility is not a bad thing...they open up games to more people...especially people with certain disabilities like myself. I like how the extra features don't seem to be forced, and M&L veterans can skip the tutorials and get to the action! I'm confused as to why all Mario RPGs now have to take place in the Mushroom Kingdom, featuring only Mushroom Kingdom characters, when the best part of all those Mario RPG's (especially Mario & Luigi) have been new characters (Fawful), surprising stories and amazing new worlds. Very odd. So I'm guessing this game will actually be an RPG unlike Sticker Star?